This cd is alluring and engaging. It draws the listener into a world where magic and melody mix to make a truly unforgettable sound. It’s an eclectic combination of Blues, Jazz, Rock and Pop with a splash of country and a swampy vibe. The title song is a beautiful and tender expression of love, romance and deep passion. It’s fabulously theatrical and touches the heart. Another favorite is “Smoke The Hookah” which is about joyous celebration of life and sharing with friends. It’s an infectious song and will stay with you long after the music has stopped playing. “The Bitter End” is a very dramatic and theatrical song featuring Raspin Stuwart singing in a lower register which is both startling and captivating. It’s full of emotion and spine tingling vocals. It’s very thought provoking and beautiful. Raspin has made an album which offers something for everybody. The songs are beautifully and masterfully written and performed. This cd is a must-have if you love great music. Five Stars! Simply wonderful. Such a perfect explaination of the emotions and connection you get with the music. 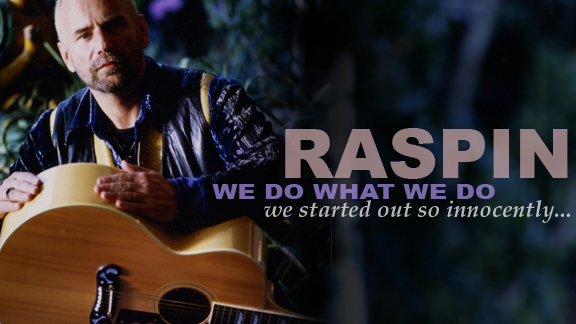 Raspin is a great musician, so unique. It’s hard to top that. Thanks Dani, I loved playing this cd!